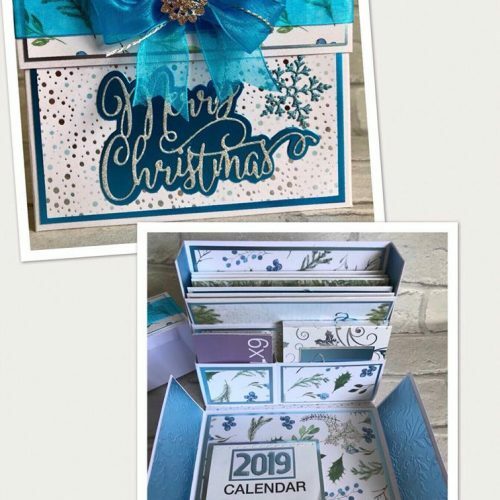 Crafter’s Companion’s talented Julia Gailes shows us how to make a stunning stationery gift box set. So grab a brew and enjoy watching this video, where she gives you plenty of inspiration and ideas to craft your own! When you have visualised the look and style of your stationery box, simply grab your Crafter’s Companion Scoring Board and get started! Further instructions, alongside the items that you’ll need, are listed below. For the components to make up the box you will need 2 sheets of 12 x 12 cardstock (you can also use 2 A3 sheets). For this project, I used Core’dinations cardstock which is around 200gsm (110lb) which I don’t score too hard. If using a heavier cardstock ie, Centura Pearl 250-300gsm (130lb) you’ll need to make score your lines heavier. Piece 1: FIRSTLY on the long side of the card, score at 5 and 7 inches (12.7 x 17.8cm) to the first score line ONLY score at 3/4 inch and 9 1/4 inches (1.9cm and 23.5cm) then at 2 and 8 inches (5.1cm and 20.3cm) all the way to the bottom of the card. Piece 2: On the long side score at 2 and 8 1/8 inches (5.1cm x 20.6cm). On the short side score at 2 and 4 1/8 inches (5.1cm x 10.2cm). Piece 3: On the long side score at 1 1/4 and 7 1/4 inches (3.2cm x 17.8cm). On the short side score at 3 inches (7.6cm). Piece 4: On the long side only score at 1/2 inch, 1, 4 1/2 and 5 inches (1.3cm, 2.5cm, 11.4cm and 12.7cm). Fold and burnish all of your score lines. Piece 1: On the long side score lines, cut a small wedge up to the first score line on each side. Turn around and repeat on the opposite edge. The 2 square middle flaps are glued down to the centre of the box. Also, fold the 3/4 inch (1.9cm) pieces at each side and apply glue to the inside and stick together. This gives the box more rigidity and forms the main body of the box. Piece 2: With the short edge towards you, cut the left score line straight up to the first score line and cut a small wedge on either side. Repeat on the right side and then turn and do opposite side too. Piece 3: There are 2 equal sized squares at each side of the card. Cut these squares out completely. Cut your mat in decorative paper/card and stick onto the card. Pieces 4 & 5: There’s nothing to cut on these pieces, but I’d stick on my mats with decorative paper/card. Now apply glue to the three flaps of piece 3. Use the main body (piece 1) of the box as a guide and stick the longer piece to the box bottom and the sides stick into the inside of the strong side flaps. This is the larger pocket that holds the cards. Do the same with pieces 4 and 5 and stick to the front of piece 3. These form the smaller pockets. With piece 2 (the lid), apply glue to the smaller left and right side flaps. Fold under and stick the middle over the top. Repeat on both sides. With a thin strip of leftover card (approx 5 inches or 12.7cm long) place glue on one side leaving approximately an inch from the end and use your pen to start rolling and stick to the box. As long as you don’t have glue in the wrong place, your pen will slide in and out easily. Now stick on all other mats and layers and embellish as required and fill with cards, stamps, tags, pen etc. 4 pieces MAT 4 7/8 x 5 7/8 inches (12.4 x 14.9cm). 4 pieces LAYER 4 3/4 x 5 3/4 inches (12.1 x 14.6cm). 2 pieces 1 1/8 x 4 7/8 inches (2.9 x 12.4cm). 2 pieces 1 7/8 x 4 7/8 inches (4.8 x 12.4cm). 1 piece 1 15/16 x 5 15/16 inches (4.9 x 15.1cm). 1 piece MAT 2 x 6 inches (5.1 x 15.2cm). 2 pieces MAT 1 7/8 x 6 inches (4.8 x 15.2cm). 2 pieces LAYER 1 3/4 x 5 7/8 inches (4.5 x 14.9cm). 2 pieces MAT 1 7/8 inches square (4.8cm sq). 2 pieces LAYER 1 3/4 inches square (4.5 cm sq). 1 piece 5 7/8 x 2 7/8 inches (14.9 x 7.3cm). 1 piece MAT 1 7/8 x 3 3/8 inches (4.8 x 8.6cm). 1 piece LAYER 1 3/4 x 3 1/4 inches (4.5 x 8.3cm). 1 piece 1 7/8 x 2 3/8 inches (4.8 x 6cm). 1 piece 1 3/4/ x 2 1/4 inches (4.5 x 5.7cm). The cards inside the box measure 4 1/2 x 5 3/4 (11.4 x 14.6cm).